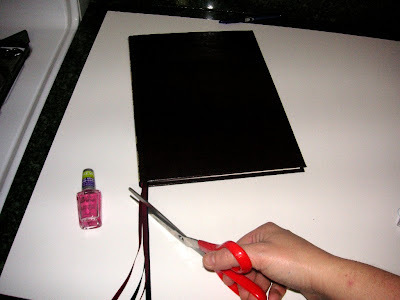 Here's a quick and durable way to add a ribbon bookmark to a hardcover book, without defacing the book. It's worth five minutes to install a set of bookmarks in a text at the beginning of a semester. Thin satin ribbon spools often go on sale at craft and sewing stores (or the craft/sewing section of Wal-Mart) for 25 cents a spool. For a text that I plan to study slowly and intently, I like to have four markers. 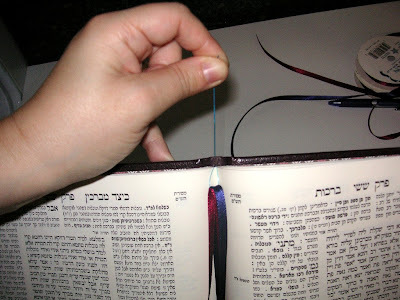 To make this, I use two colors of ribbon, each cut to more than twice the height of the book. This will result in two markers of each of the two colors. 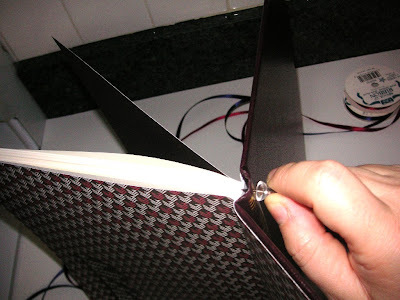 I start by poking a hole in the top of the spine with a thumbtack (or safety pin), just above the top of the pages. I use a dental floss threader to attach the ribbon securely. In the picture below, you can see the floss threader threaded through the thumbtack hole. 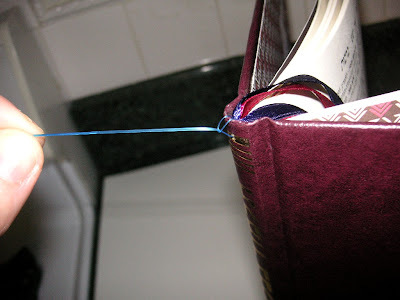 I kept this picture in the tutorial because it shows the threader and the hole very clearly, but when I do this, I start with the loop on the opposite (inside) side of the book, with the lead on the outside. 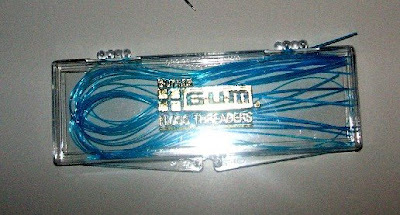 Thread the ribbons through the floss threader's loop. Pull the floss threaders taught. Feed the tail end of the threader back through the threader's loop on the inside, and pull taught again. 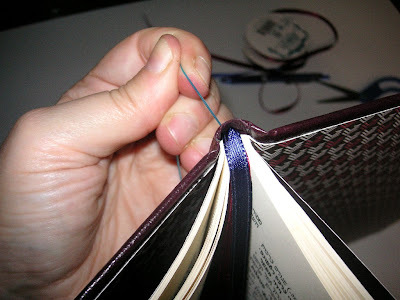 Tuck the long end of the tail into the space between the cover and the book's pages. I use a cake tester or barbecue skewer to help push the tail and keep it from bunching up. 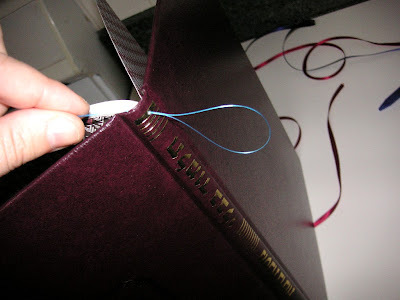 Lifting the ribbon up and over the back of the book, secure the ribbon/threader knot with a tiny bit of glue. 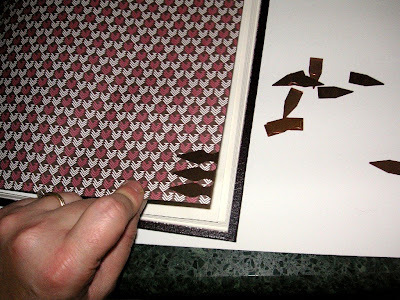 Be careful not to let the glue get on the pages or interfere with the pages' movement. Obviously, this isn't suited to heirloom or very expensive books. But, for a "working text", I think the floss is discreet and unobtrusive. I suppose, it could be painted to match the book's spine, too. 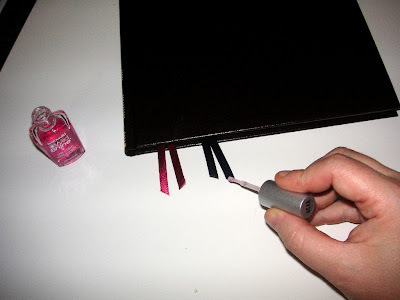 Trim the excess length of ribbon on the diagonal, and (optional) add a dot of nail polish to the ribbon ends to prevent fraying. A few bookdarts conveniently tucked away on the back page, and voila! Ready to study! 15 comments, so far. Add yours now! Just so cool. Love it, thanks. I've done something similar, stitching the ribbon directly to the headband. 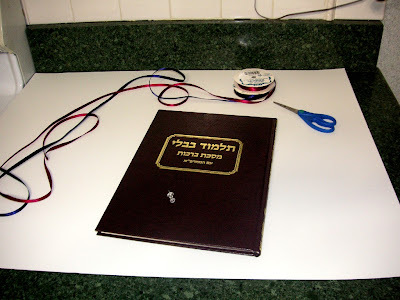 Your technique, of course, will work even if the book lacks a headband. Nice use of photos too! Your blog is wonderful. Many nice ideas! What a great little idea. 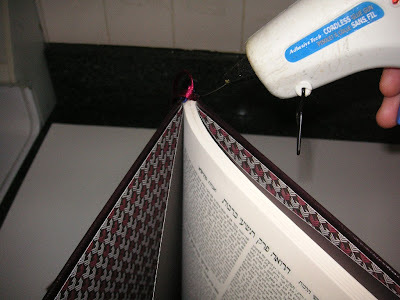 Now i can remove all the little papers from the seforim without ribbons! I'm making a link to this project. great idea! Again. This is such a great idea, I'll be linking! 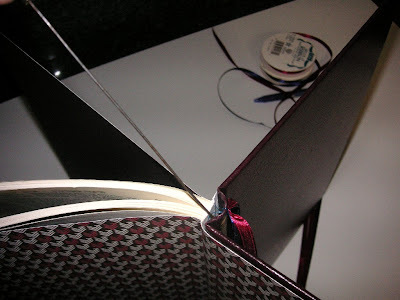 I put some white glue on a chopstick or knitting needle and push the ribbon between the spine and the book. 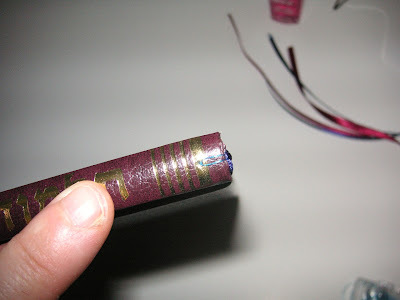 This is a very nice tutorial on how you can actually make a bookmark on your favorite book without actually destroying it.